As illustrated embossed walnut frame with gold edge. 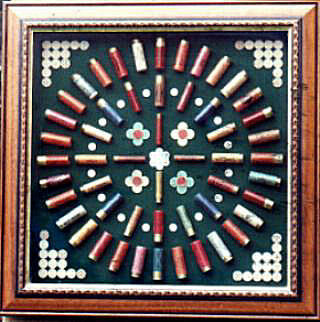 Hand made display mounted on green baize behind glass. A great collection for the game hunter - Display Contains 12g, 16g, 20g, 28g & 410. - attractively displayed with over shot cards. * Rounds may vary from those listed without prior notice. EACH CARTRIDGE OR ROUND IS CAREFULLY SELECTED, DEACTIVATED AND HAND MOUNTED in England.